So I spent days getting the girls special outfits made for their first days of preschool this year, then Chloe went for her very first day and brought home the funk and knocked all 4 of us girls out! The Hubs managed to escape it, but the rest of us spent all last week drowning in snot. By the end of the first day everyone had red, raw noses from blowing and wiping. Ella wanted me to wipe hers, but it hurt and she’d scream while I tried to help her breathe. 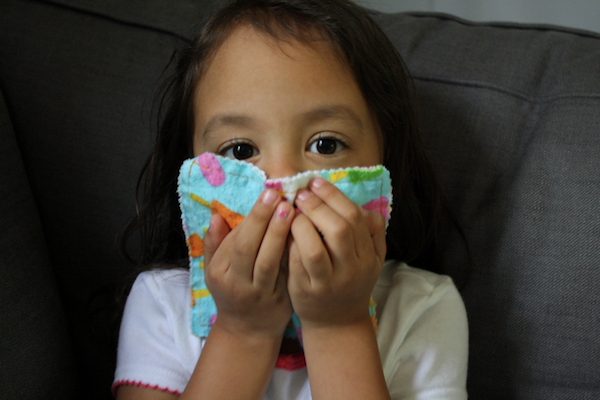 I personally hate tissues, so out of desperation, I had us using fabric out of my scrap pile instead. 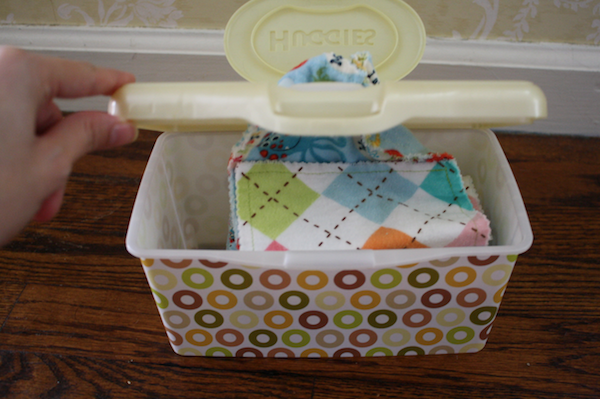 Then I came to the brilliant conclusion that I should just make us some flannel tissues! They were simple to make and took me all of an hour start to finish. The girls enjoyed using them and didn’t fight me on wiping. 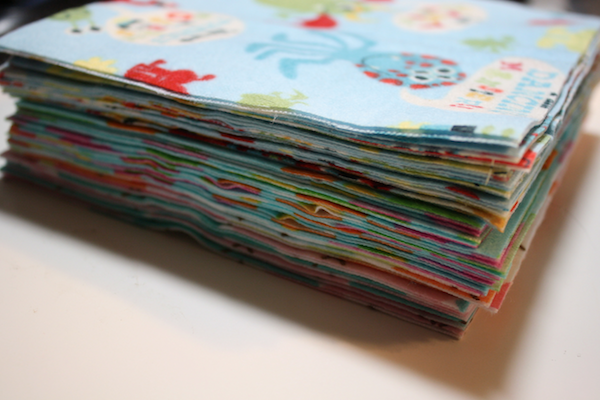 I spent a few minutes cutting 6″ by 6″ squares from fabric. I ended up making us 30 tissues. 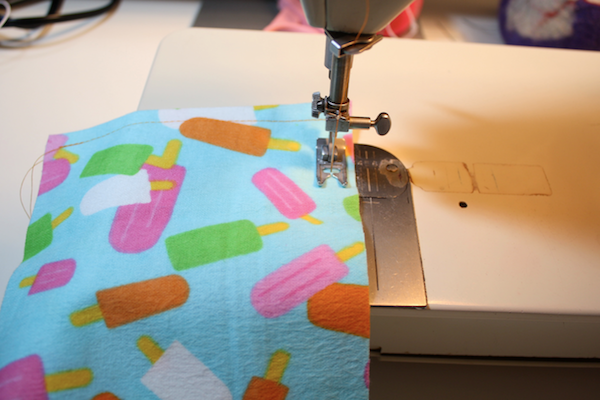 I wanted them to be 2-ply, so I left my fabric folded with wrong sides together when I cut. 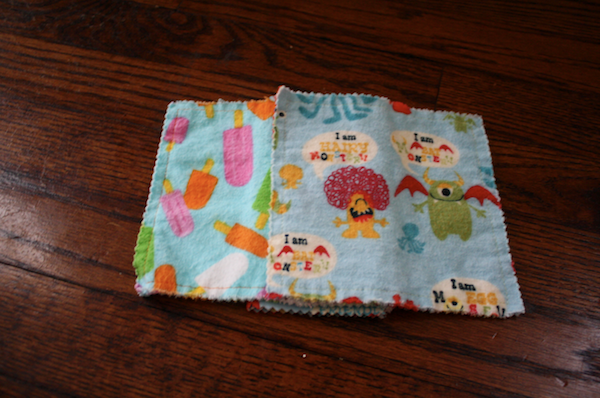 Then I used a straight stitch and sewed around them at a 3/8″ seam allowance. 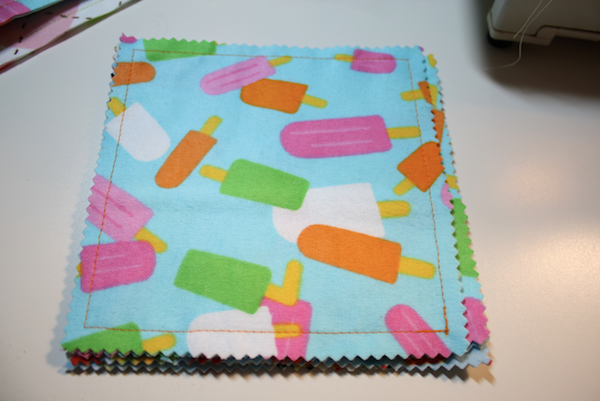 Staying right at the edge, I clipped the edges with pinking shears before I tossed them in the washer. When they come out of the dryer, clip the threads that frayed and start blowing! 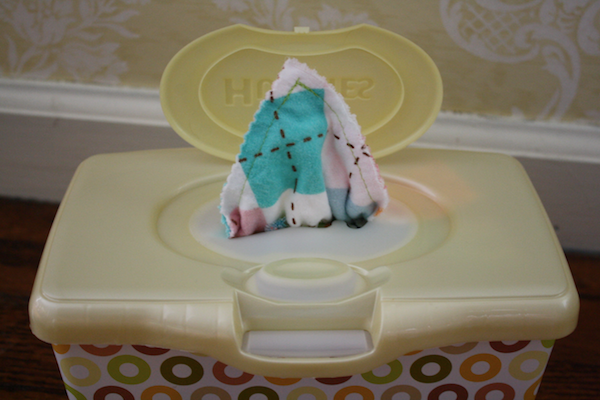 We used an old wipes container to store them and I was ridiculously happy when I figured out how to fold them inside to make them pop up as you pull each one out! 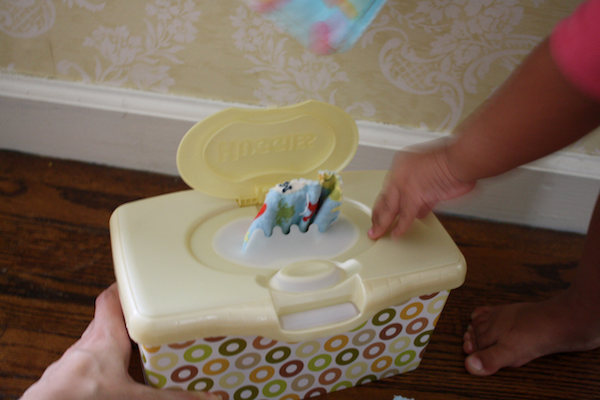 And our 30 wipes were the exact right size to fit in and fill up the tub! 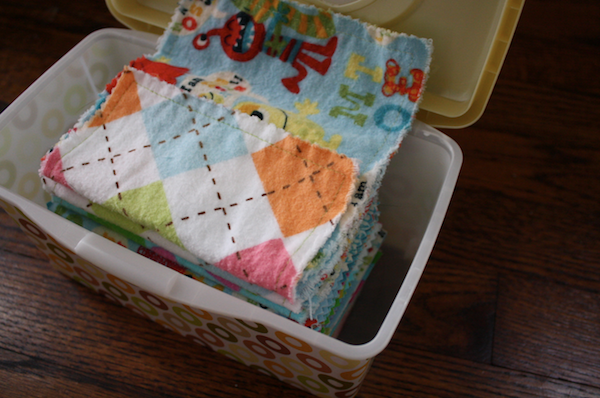 To fold them, place 2 on top of each other lining the edge of one with the middle of the other. Take the one on the bottom and fold it over. 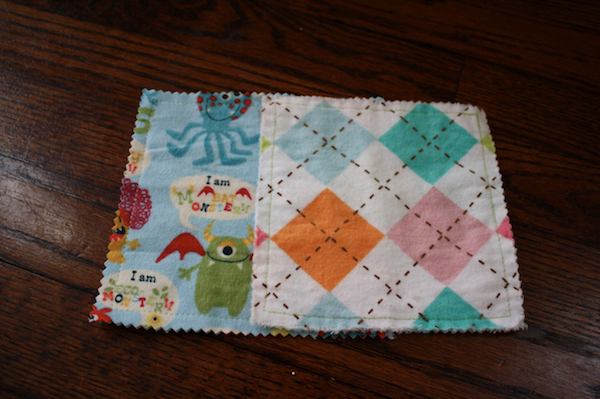 Then take the next one and lay it on top of the one you just folded, lining the edge up. And fold the one on the bottom up. Just keep repeating until you’ve got them all stacked up. Then stick the top one through the hole in the container and you’re ready to go! Hope your nose stays happy this winter! Thanks for this idea, I really want to make some for my grandchildren. I’d say this saves a lot of money as well! Oh, cold weather, you won’t caught me unaweres! Do you think it would work just as well to serge/overcast the edges instead of stitching and pinking? What a great idea! I don’t like paper tissues either. 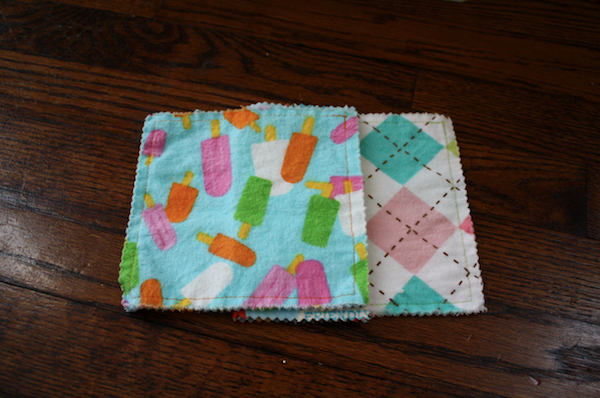 My mom always had cotton handkerchiefs and I still buy those, but for a bad cold they don’t work to good. Maybe I should make a few flannel ones, like you did. I love this idea, but I have some questions. Do you just throw them in the wash, do you rinse them first? 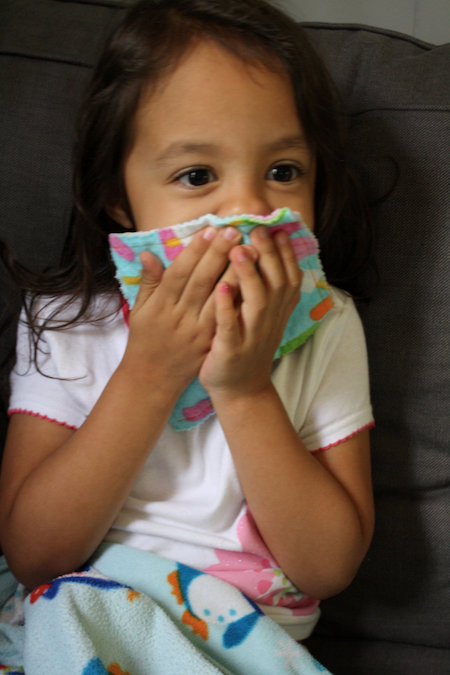 Sometimes when they get a cold, a nose blow can be pretty “productive”. Also, now that you’ve had them for a bit, are you able to keep up with keeping them washed and in a container? I would worry that mine would end up spending most of their time in a laundry basket. Honestly, we haven’t really used them since I made them and we were all sick that week. So yes, they’re in the container! 🙂 I do like to pull them out and use them as coasters or occasionally to wipe up a wet or messy face. Since we’ve only used them sporadically since then, they do tend to make it back in the container. And no, I don’t rinse them first. Our laundry room is right off the kitchen/living room so I just toss everything straight in the washer and turn it on when it’s full–about every other day or so. So when we do need them again this winter, they’ll get turned around in the laundry and ready to be reused again quickly. Brilliant idea.I’m excited to make two of this.I’ll give one to my mom.Simple yet colorful diy tissues.Thanks for sharing. Wow!!! I just made my first box of these and everyone wants them for their bedrooms. 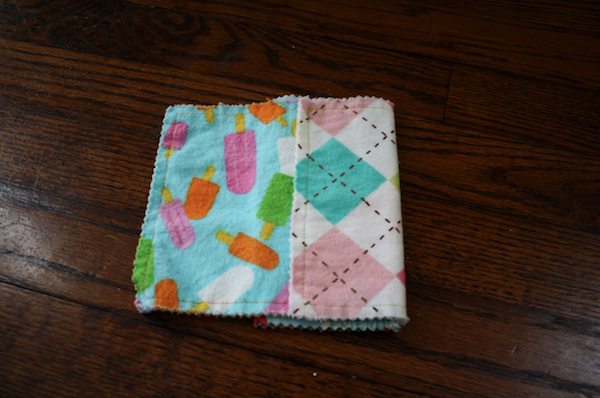 I am using up flannel that I bought 11 years ago to make sheets and blankets for my now 11 year old. Thanks for helping me find a way to reduce and reuse!!!! 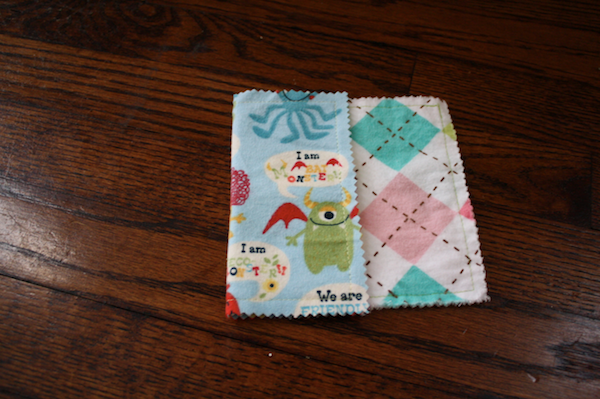 I wanted to comment that I have made lots of these using both flannel and old tee shirts by both the stitch and cut and the stitch and turn method. These all wash up great in hot water which I use for sheets and towels because of my allergies which is why I made the clothes in the first place. You could, I suppose, rinse them or soak them before washing especially if you wash in cold. What a nice green idea.. 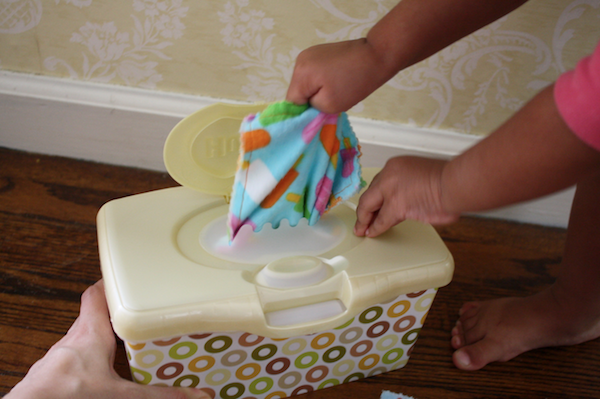 This would be great to have in the car also for little ones ice cream wipe ups etc.